So much is going on this summer, you do not want to miss out! Sign up for PRIMECRU and stay in the know! The Wine Sale is one of the best events of the year. I go through the wine cellars at all of my restaurants and clear out inventories. Everything is sold at Island prime. The private dining room is turned into a 3 hr wine shop. All the wines are laid out across the room and put up for sale at well below retail pricing, we call it PRIME CRU pricing. We pass out hors d’oeuvres and sample some of the selections. Anything you buy can be taken next door to C-level and enjoyed sans corkage. Arrive early as the line builds up and supplies begin to disappear rapidly. Here is a Sample Wine Sale List for July 21st, 2018. This is the 4th annual CRG art and wine show. I gather all the artists who work within our restaurant group all who are servers, bartenders, hosts, cooks and managers many of which are artists. They show their work and I pair each artist with a wine. There is a method to this, you can read more about it in a previous article of Pairing Wine and Art. The Prado will provide tray passed hors d’oeuvres, wineries will feature their paired wines, and artists will talk about their work and how the wine pairs with it. All of the wines and the art will be available for purchasing, again at those deep PRIME CRU prices. 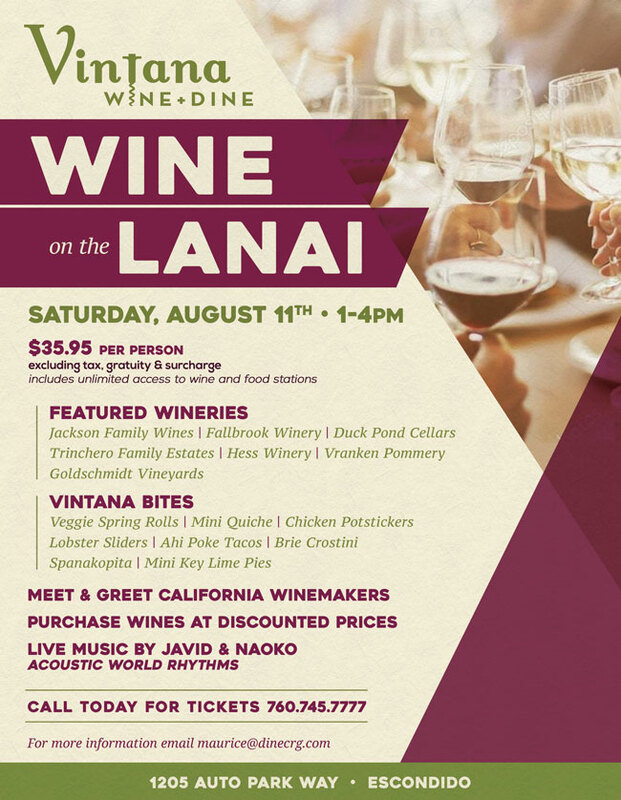 Still not enough wine, then visit us in North County at Vintana, directly above the Lexus dealership for our Wine on the Lanai event. Chef Chris Barre will send out endless hors d’oeuvres while you greet and meet with winemakers and representatives from different wineries from California. Enjoy Aperol Spritzers at the Aperol cart, try your hand at blind tasting with Jackson Family Wines or guess the vintage of some of the wines from the cellar of our owners’, David & Lesley Cohn. Acustic world rhythms will be played by our guests, Javid & Naoko. Our wine director, Mike Lewis will also have some wines pulled out for you to take home, again at Prime Cru prices! 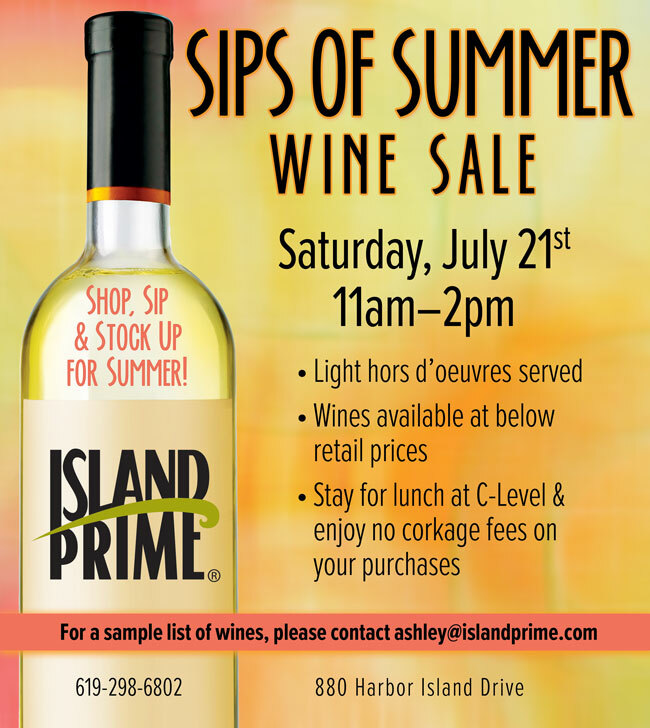 Mark your calendars and keep this Saturday saved for the best wine event of the year. I like to think of it as an adult Chuck e Cheese. Coasterra’s ballroom and Skyline patio will be converted into the ultimate wine festival. There will be well over 30 different wineries and all of them hosting a table with an interactive element. There will be blind tasting, grape tasting, grape stomping, live art, wine Family Feud, disgorging champagne, aroma wheels, music and wine pairing, the effects of color and wine, and plenty of wine tasting. At each table you will earn participation tickets which will be redeemable at the festival wine shop for swag and wine. Again you will see some unique selections form our cellars there. Chef Deborah Scott will provide live taco stations and tray passed hors d’oeuvres. This event is super fun and should not be missed and the best part it is in the best location in San Diego overlooking the bay and the city skyline. Thank you for writing this blog! I really was looking for wines events to attend and then I read your blog. I hope I get to taste great wines!